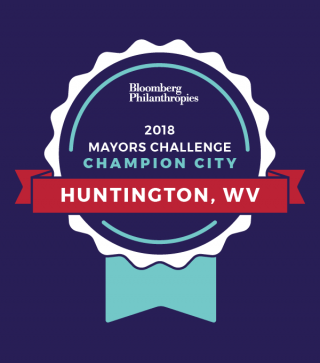 Huntington, West Virginia, is one of 35 Champion Cities selected today as finalists in the 2018 U.S. #MayorsChallenge, a nationwide competition sponsored by Bloomberg Philanthropies that encourages city leaders to uncover bold, inventive ideas that confront the toughest problems cities face. These 35 urban innovations rose to the top of a competitive pool of more than 320 applications. The Champion Cities will now begin a 6-month testing phase where they will conduct public prototypes of their ideas with grant funding of up to $100,000 per city. Since 2016, Huntington has implemented several innovative solutions to addiction that have served as models for recovery across the country. Huntington is now focusing on its first responders, who are suffering from compassion fatigue as the from the volume and frequency of overdose calls. As part of this competition, the City of Huntington proposes to embed mental healthcare professionals within emergency response departments to provide in-house mental health support to first responders suffering from compassion fatigue as well as connect individuals suffering from addiction to treatment and recovery resources. For more information about the competition, visit www.mayorschallenge.bloomberg.org.